So what is behind all this talk of cable TV consolidation? And they both pointed to one thing — John Malone, the original cable cowboy, is back. For those who don’t know him, Malone took a hodgepodge of cable companies, rolled them up into TCI and flipped that to AT&T. Later, Comcast bought that business and became a national player. Malone laughed all the way to the bank. Later he started building a cable business in Europe (Liberty Global) and has done well with his European diversification. John Malone’s Liberty Media (s LCMA) is thinking about buying Time Warner Cable (s TWC) via Charter Communications. Charter is the fourth largest cable player in the U.S. and Malone already owns 27 percent of Charter. Liberty Media CEO Greg Maffei recently met with Time Warner CEO Glenn Britt. The talks aren’t going anywhere. Time Warner Cable, on its own, has talked to Cablevision (s CVC) and Cox Cable about merging with these entities. You would think that Liberty and Time Warner Cable are trying to build a mega-cable provider so they can compete with Comcast (s CMCSA), currently the largest cable provider in the United States. And you would be totally wrong. The reality is that cable companies don’t really compete with each other. They have their own territories — you know, like the Mafia families in The Godfather — and they don’t muck about each other. Their supposed competition are phone & satellite companies. Of course, when it comes to the old-fashioned (linear) video, these guys are competitors. Netflix (s NFLX), Hulu and YouTube (s GOOG) are programming our video watching behavior — any amount of video, anytime, anywhere on any screen, as long as there is broadband. The more we watch internet video, more bandwidth we need. The fact, that cable companies (big and small) have already started to meter broadband and are putting limits on the networks; we are only on the cusp of seeing a big inflation in internet access costs. Why? Because cable companies are virtual monopolies. Two major phone companies — Verizon (s VZ) and AT&T (s T) — are more interested in fleecing their customers by making them pay through the nose for their pokey but expensive wireless broadband connections. Comcast sold Verizon some of its wireless spectrum and Verizon sells Comcast broadband to its customers outside of its home territories — now that is some competition. And the worst part — there is nothing little guys can do about it. The Beltway bandits are happy to turn a blind eye and the Federal Communications Commission (FCC) has no interest in doing its job. So next time you read about a media merger, just remember: it’s all about broadband. This play seems to be caught in a time warp. I presume Malone is well-aware that the content and transport business are splitting apart with TWC being apart from the larger TW business and Comcast shifting emphasis to content via NBCU. That leaves the business of fat pipes but there is no intrinsic value in the pipes so you can only create value if you are a rent-seeker and can manage scarcity. But how can you do that when there is the perfect commodity that isn’t even consumed? As I wrote in http://rmf.vc/NotSuper not only is there the problem of over capacity from redundancy pipes are the wrong metaphor. It’s as if a railroad presumes a truck convey must all stay within a single lane. Netflix can do wonders with only a megabit or two and the content is cached at the edge so how do you assure scarcity? You write about the rationale for cable consolidation, but ignore the #1 (and #2, and #3, and #4) reason? Seriously? Cable operators are looking to consolidate to get more negotiating clout vs. the content providers (Disney, Fox, Time Warner, etc), who have been getting an ever-increasing share of the revenue pie, with the rates they charge to cable companies rising 7-8% a year (while the prices paid by consumers have been rising 3-4% a year). In the U.S., the price of high-speed Internet more than in Ukraine. 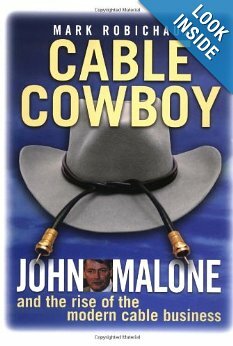 John Malone and the cable companies are beating a dead horse. They’re doing their best to stop competition but they’re toast and they know it. You can’t even think about 4k or quick downloads on HD programming on cable networks and they’re holding on by their fingernails to keep market share, and losing. Here comes iptv and 1gig symmetrical fiber networks and as they deploy, you’ll see the cable companies continue to die just like the dinosaurs. Where are you getting this? 4k requires around 8-10Mbps. Typical US cable network has around 4.6-4.7Gbps of capacity. That’s around 500 simultaneous streams. With around 125-150 customers (assuming 50% take rate) on a node, you’re looking at about 4 streams per home, using today’s technology and compression. Cable’s got lots of capacity. I call the cable companies government approved anticompetitive monopolies. The cable companies have bought local, state and federal government officials. Good piece and once again Malone is onto something smart but he had better hurry up before Google Fiber starts to roll into more and more cities.